I'm a mother and a biologist/geneticist, providing information on parenting both instinctively and based on the latest high quality science. Kabuki brush: makeup brush with a short stem and dense bristles, usually rounded on top but sometimes flat. Before child (BC), a wonderful beauty therapist introduced me to the magic of pressed mineral powder foundation and I was an instant convert- just a few quick brushes and lovely, even coverage. I felt transformed! And with the Jane Iredale pressed powder she got me hooked on, I also had to get used to the Kabuki brush for application- a very costly, natural haired one of the same brand. Kabuki brushes derive their name and design from their use in Japanese theatre. Actors wear Keshō, a very heavy makeup and the brush is used to apply white rice powder all over the face. Now though, they’ve been adopted widely out of Japan for application of loose powder, pressed mineral powders, blush and bronzer as they should create a very even coverage and natural look. Is the hype worth it? And should we be having more women-to-women discussion about the pitfalls of the Kabuki brush as current design stands? I think so. It’s time for a Kabuki revolution. After delivery (AD) I could no longer afford the divine, but expensive powder or occasional therapist visits for that matter and it was time to fork out for less costly brands. I still had the expensive Kabuki brush but the cheaper brands came with their own cheaper brushes to try. All though of these brushes I have used irrespective of cost or natural versus synthetic hairs have the same annoying problem- they shed short (usually 1-3 cm (circa 1 inch)) hairs, making my vanity unit top at times look like someone has been plucking unusually long eyebrow hairs out, and worst of all leaving them dotted over my face. Mothers are time poor. Working mothers are incredibly time poor. We need products that deliver and work fast. We generally want to look as glamorous as we can in no time. Spending just as long as the actual makeup application, if not longer, picking off little brush hairs from my face before I depart the bathroom and dash out the door running late for work or anything else isn’t exactly my idea of fun. It negates the time saving benefits of the hallowed Kabuki brush and I resent having to perform this daily ritual. Besides that, these brushes aren’t cheap- my current one- a mid-price number, the natural hair Antipodes brush, at a cost of 40NZD claims on their website: “You’ll be rewarded with at least six months of daily use from this brush if you treat it with a little tender loving care.” I sure would expect more than six months of use from a brush for that price. The saleslady who sold it to me not that long ago was aghast that my super expensive Jane Iredale brush shed and said no decent Kabuki brush should and that one should get years of use out of each brush, but lo and behold the Antipodes alternative does shed profusely as well. Some brushes, the synthetic ones (such as Thin Lizzy’s) shed profusely and those hairs are evil. They have a sneaky habit of finding their way into my eyes, often poking down from my eyelids in a mysterious location and then being impossible to spot instantly. They’re incredibly irritating and sharp and can take 1, 2, 3 or even more minutes to find sometimes. I wonder if synthetic brushes like this cause significant eye irritation to women or even an increase in eye infections- sadly no one else looks like they have considered the same question from a medical research perspective as I couldn’t find any literature on this. There is a Kabuki Brush Syndrome*, however. I’m not alone in my Kabuki problem. At this stage brush shedding seems largely one of those unspoken topics like post birth stitches/episiotomy or bed sharing but my aim is to change that! I see the signs around me- the stray hairs sitting on some stranger’s face, evidence of yet another sub optimal Kabuki brush. What should be the etiquette here- do you tell them that they have a hair on their face or let them finally get a chance to race to the toilet at 3 pm for the first time all day and discover that they’ve spent the entire day looking more hirsute than they really are? On Christmas Day I succeeded in having a brief brush discussion and we three were all in agreement- no matter what the cost the brush sheds. Is there a perfect, non-shedding Kabuki brush out there hiding at the end of some elusive rainbow and can one be sourced in the far reaches of the earth, New Zealand? I turned to the web for answers and discovered others have also questioned. Yahoo Answers reply suggest Lumiere’s synthetic kabuki is a non-shedder; some cheaper alternatives are also given. Another review site compares two brands, although both their options shed they discovered. And can you improve what you’ve got? : a tip here suggests when dry rubbing vigorously on a towel to remove the hairs. Maybe, although it hasn’t sorted my brushes. Another tip is to ensure regular (once a month is ideal) washing with shampoo or mild body wash – that may help alleviate the shedding and extend the brush life. Be warned though- the method of washing may amplify the shedding effect if you let water get into the ferrule- read here for a great way to dry without too much water getting inside, although to be honest the capillary effect of drawing water up the hairs is probably going to get the insides pretty wet however you do it. Is there anything else to be concerned about with our makeup addictions? Plenty, really. Apart from our skin being a sponge (akin to eating something in a sense) and most makeups being packed full of some pretty interesting chemicals, inhalation of our powders into our airways, including our lungs, when we are brushing away (ditto for spray on moisturisers and sunscreens) is a concern as investigated by Nazarenko et al in 2012. This is primarily because many of the powders contain particles in the nanoparticle size range (i.e. very small). There is mounting concern over these very small engineered particles and their toxic effects in us and other animals, but there is a distinct link of quantitative exposure data. If you’re breastfeeding or pregnant, these chemicals may well make their way to your baby and I may delve more into nanoparticles in future posts. In the Nazarenko study though, they found most of the particles inhaled in comparison of a few cosmetic products weren’t larger than nanoparticle size, whether the product contained nanoparticles or not. These larger particles mainly ended up in the head airways, rather than going lower into the lungs, which was contrary to previous models. Their research suggests that we should possibly be most concerned about predominantly silica-based powders as the greatest inhalation load came from this versus other powders. One thing to think about is how many ingredients there are in a particular product and what the combined toxic/interactive effects may be. It’s a dangerous world out there, engaging in makeup application. 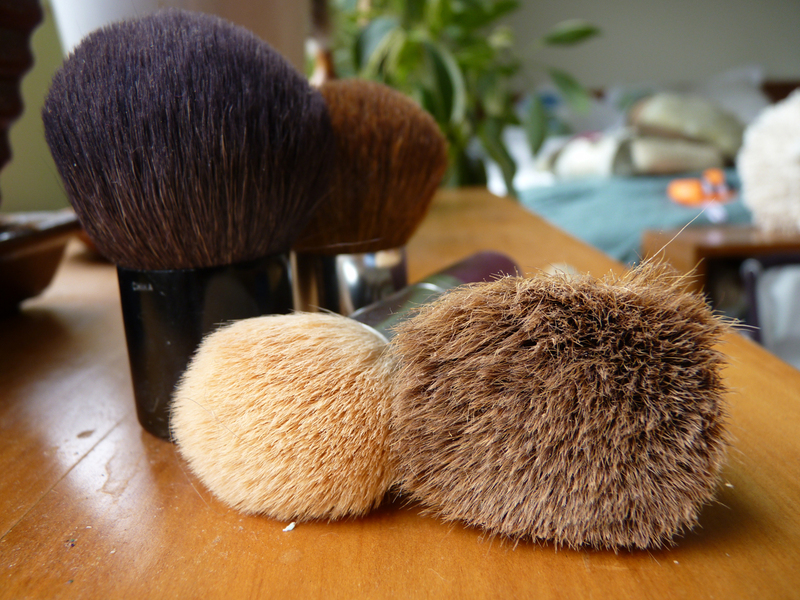 If you truly have experienced a non-shedding Kabuki brush I would love to hear about it, especially if it’s available in New Zealand. In the meantime, for Tweeters, please join me in using the hashtag #wedeservebetterkabukibrushes to start the Kabuki improvement revolution! Tweet to the companies that make your brushes (or email them) and ask them to put some decent R&D into perfecting non shedding brushes. Science should be able to give us the brush we all long for and let’s face it, excusing the pun, we deserve it! DISCLAIMER: I have no affiliation with any cosmetics company. This entry was posted in Humorous and tagged cosmetic, eye, inhalation, irritation, Japan, Kabuki brush, makeup, me-time, mineral powder, Mother, nanoparticle, powder foundation, toxic on January 12, 2014 by vicmetcalf. Parenting by instinct is written by Victoria Metcalf, PhD. Lecturer in biology and genetics and research scientist as well as mother to a four year old daughter.